Well, we’re just past the 6 month mark of 2013. Halfway through the year. This is usually a good time to take stock of your work and life. What have you accomplished in the past 6 months? And with 6 months of the year left, what are you going to do for the rest of the year? In this article, I’m going to cover 11 items that every affiliate marketer should do if they’ve not already did them. There are a variety of reasons to do these – expanding your knowledge, having different experiences, and improving your current websites both in the short-term and long-term. Plus hey – just trying something new, mixing it up once in awhile. This is aimed both at new affiliates and existing affiliates. I’m sure most of you have done a few things on the below list – but it’s doubtful you’ve accomplished them all. Do that, and you’ll be a lot stronger as an affiliate. What: Pick a campaign to run on Google Adwords and/or Facebook ads. It can be advertising to your current website, to a money landing page, a landing page set up for e-mail harvesting or even just pick a random affiliate product and promote it. Why: First – these sort of ads are a big part of the internet ecosystem and if you’ve never ran any campaigns – you really should. Second – it’s a solid learning experience. As an affiliate you generally have low risk, and can survive on 1/100 conversion ratios. But in this case you are PAYING for visitors. You can’t afford to have crappy conversion rates. If you’re converting at 1/100 you can’t sit back and say “oh well” – because those 99 other visitors are COSTING you money. When the pressure of money comes into it, it’ll really allow you to take a good look at your current websites and give you a whole new perspective. What: The other side of the coin – build a website which makes money solely from Google Adsense, and all the people running campaigns in AdWords. Why: It’s probably a whole different experience from what you are used to. You don’t have to write articles geared towards affiliate links anymore. Instead you can write purely informational articles, with no need to try to “sell” to the user. Instead you need to focus on ad placement, and you can learn a lot from that. This is probably one of the easiest ones on the list too. Use the WordPress default theme or buy something like the Heatmap Adsense Theme (which isn’t just about making money – the ad placement options will teach you a lot). Spend a couple hundred bucks at iWriter and you’ve got yourself a website built around Adsense. Learning about ad placement is HUGE though – yet is something most people take for granted. What: Take something on one of your existing websites and split test it. Why: Split testing is huge. It can make you more money, and it can also help you understand what makes you money and what doesn’t make you money. It’s also one of the best ways to get into the visitors mind – you will start to understand what works and what doesn’t work – and more importantly WHY it works. Everyone talks about split testing but from what I’ve seen – few do it. Try it out. Maybe try different varations on getting someone to click a no deposit bonus or subscribe to a mailing list. Hell – even combine this with #2 and run different ad layouts to different visitors. What: Simple – outsource something, be it content or a website design or a small project for your website. Why: This is something lots of new affiliates don’t do – they never outsource. They wear many hats – do their own logos, set up their own website, write the content, set up affiliate links, build links etc. While that’s fine in the short-tern if you’re short on money – you really need to start outsourcing sooner rather than later. If you’ve never outsourced before then pop out and hire someone to design a logo, or get some content written at iWriter or something. Believe me – I’m a real hands on sort of guy and I always found it hard to stop doing everything myself. But to really grow as an affiliate, you need to start outsourcing as soon as you can. What: Write down 100 things wrong with one of your biggest websites. Then fix them all. I see this page every day. And it wasn’t until I was doing this list that I realized how TERRIBLE it is. This is the most popular landing page on the site – yet there is only ONE link to the bloody landlord forms – the whole point of the site. And it’s tucked away in the nav bar – an area where many users blank out. Instead we’ve got a Youtube video which doesn’t even autoplay and adds nothing. 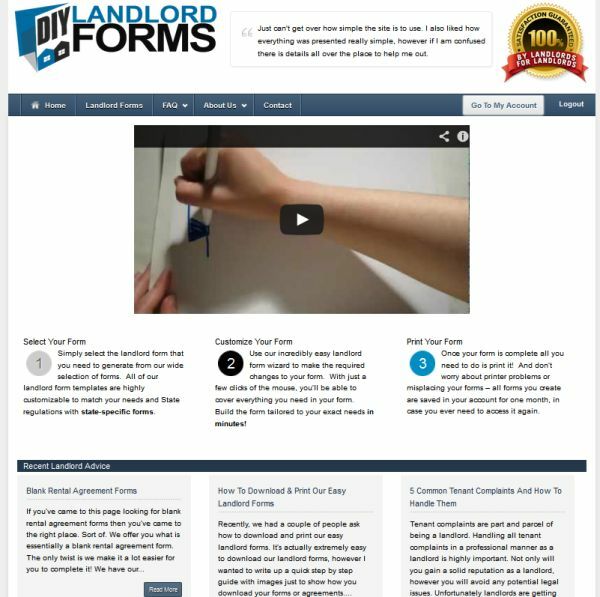 The step by step guide is fine but it doesn’t have any bloody links to the landlord forms – then we’ve got the blog section below – which we don’t want people to be clicking. We want them to go straight to the landlord forms! This is downright embarrassing, yet something I never really thought about until I started looking at the site with a really critical eye. (And Heatmap data backed up the fact that a decent percentage of visitors were skipping the “Landlord Forms” link and were lost). Start this, and don’t stop till you’ve came up with the magic 100 number. You’ll be surprised how many glaringly obvious errors you’ve missed, or weak conversion pages you find. This is one of the most important one for existing affiliates – step out of your comfort zone. A good humbling is good for you. What: Use Twitter. Not as a marketer. As a consumer. As an end-user. As the average Twitter person. Why: Twitter isn’t going away. It’s getting more popular and more valuable by the day. More people are realizing the value of Twitter – especially when it comes to a news service. The Boston Marathon Bombings were a huge indicator of that. Yet most affiliate marketers I know “don’t get Twitter”. They sign up, spam their links on it, shake their head and move on. Don’t do that. Sign up with Twitter, follow some national and local news services, some local businesses, any of your friends, celebrities who you have interest in. Just try to interact with people normally. Reply to famous peoples tweets. Just “get” Twitter. Be sure to read my interview with Graham Rowlands for more on that topic. That was written a couple of years ago – but it still stands today. What: Use programs like web analytics software or heatmap tracking software to keep up to date on your visitor, who they are and what they do. Why: When you first launch a website, you’ll usually spend a lot of time learning about your visitor. You should, anyway. But as time goes on, you get lazy or busy and you stop learning about your visitor. Yet they’re evolving, technology is evolving and you really need to keep up to date with them. I have quite a few websites where I really stopped paying attention the visitor – websites that were earning good money. It got to a point where I felt I already knew the visitor and the process was simple – new content every day, and update existing content when required. Just keep doing that and as the content grows, the visitors grow, and the income grows. Easy peasy. Then glancing at the stats the other week – I noticed that 60% of visitors were mobile users. The website wasn’t even responsive!!! And it didn’t even look that good on a mobile browser. How much bloody money have I been missing out on due to that? Since then, I’ve changed the outlook of the website for mobile users, AND am building an app specifically for that crowd. So go back and study your visitors. You’d be surprised what you can learn. Pick a site, spend a few hours and just go nuts staring at stats. What: Find a local small business – preferably one that you frequent on a regular basis – that does not have a webpage. Then propose you create a business webpage for them. Why: First of all – we should all be supporting local businesses. Many of them would like a website, but simply don’t have the technical know-how to do it, nor the money to really afford it. You can offer to do one on the cheap, or free. For example – my local massage therapy clinic which I frequent every few weeks had a horrible website created from 2005(5 page website, 2 of which had been marked ‘under construction” for years). They’d dropped dramatically in the search engines which was losing them clientele. I took the job on for a very low budget, built a website from scratch and worked my SEO magic. I am also in the process of doing a website for my local barber shop for free. The owner really doesn’t understand the internet too well and would never be able to create a website. He’s also barely running a profit – no way could he afford to get a website not does he see the benefits to doing it. So I’m stepping in and setting it up for him free of charge. As the years pass, localized marketing is HUGE and is just getting bigger and bigger as time goes on. The education you can learn from this is invaluable. You learn so much more about local marketing, about optimizing via Foursquare and Yelp etc. Honestly out of everything I have accomplished this year – building that massage therapy website was my favourite because I learned so damn much that I wasn’t aware of. And it was fun as hell to do it. It’s a great educational experience – plus you’re supporting local businesses. Can’t beat that. Why: It makes you stand out in the search results. The difference in clickthrus ranking #3 without a picture, compared to #3 with a picture, is huge. Seriously if you’re not doing this you better have a good reason other than being allergic to money. What: Spend some time on the website marketplaces such as Flippa or forums were websites are bought and sold, and purchase one. Why: This is a really big move in regard to learning legitimate business skills and is a great educational tool. Even better if you pick a website whose topic you don’t know much about. Bonus points if their revenue streams are avenues that you have never explored. You’ll get to learn a lot about buying a property, exploring what works and why it works. You then have to keep that income coming in, while also attempting to expand on that and start making more income per month than it was making when you initially purchased the website – that’s generally how buyouts work. It’s an awesome way to really learn more about making money online and expand your knowledge – by throwing yourself into the deep end. What: Put your hand up if you use WordPress for your websites. Keep your hand up if you use an SEO plugin. Oh look – all of you. Keep your hand up if you could provide a thorough explanation as to the potential positives and negatives of every single option within that plugin. Oh look – not a single hand is up. Why? WordPress SEO Plugins are great – but you really, really need to know what they are doing, why they are doing it, and both the positives and negatives of it. It scares me that people will install a plugin and allow it to rewrite their titles, noindex pages on their website, stripping out or adding information to the code and changing your URLS with little idea behind the “why” of it. Spend some time this Winter at your computer, going through every option on your favourite SEO plugin and then reading up all the contrasting opinions or reasoning behind it all. You’ll be a lot smarter when it comes to SEO after doing this, with a much more solid understanding. The internet, and the marketing dollars behind it, are constantly changing and evolving. You need to expand your arsenal and knowledge while being prepared for anything. You don’t want to be one poorly-implemented Panda/Penguin update away from bankruptcy. This article was written on July 18, 2013 however all articles are looked at on a monthly basis and updated to keep them relevant.